Definition at line 728 of file DeclObjC.h. Number of bits fitting all the property attributes. Definition at line 754 of file DeclObjC.h. Indicates that the nullability of the type was spelled with a property attribute rather than a type qualifier. Definition at line 732 of file DeclObjC.h. Definition at line 760 of file DeclObjC.h. Definition at line 759 of file DeclObjC.h. Definition at line 960 of file DeclObjC.h. Definition at line 961 of file DeclObjC.h. Definition at line 2218 of file DeclObjC.cpp. Definition at line 2230 of file DeclObjC.cpp. Lookup a property by name in the specified DeclContext. Definition at line 176 of file DeclObjC.cpp. 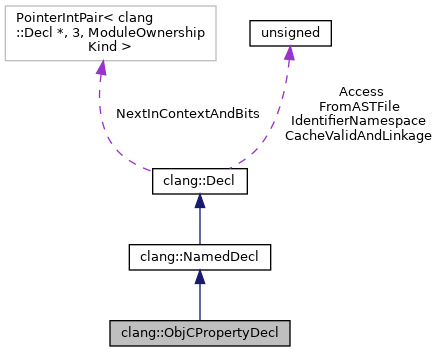 References clang::DeclContextLookupResult::begin(), clang::DeclContextLookupResult::end(), clang::ObjCProtocolDecl::getDefinition(), clang::DeclContext::lookup(), clang::OBJC_PR_query_class, clang::OBJC_PR_query_instance, and clang::OBJC_PR_query_unknown. Referenced by clang::Sema::DiagnoseUseOfDecl(), clang::ObjCContainerDecl::FindPropertyDeclaration(), clang::ObjCInterfaceDecl::FindPropertyVisibleInPrimaryClass(), clang::ASTContext::getCommentForDecl(), clang::getCompletionComment(), clang::getPatternCompletionComment(), and clang::sema::FunctionScopeInfo::markSafeWeakUse(). Definition at line 820 of file DeclObjC.h. Referenced by checkAllProps(), RewriteOneForwardClassDecl(), and clang::ASTDeclWriter::VisitObjCPropertyDecl(). Get the default name of the synthesized ivar. Definition at line 224 of file DeclObjC.cpp. References clang::IdentifierTable::get(), clang::NamedDecl::getIdentifier(), clang::IdentifierInfo::getName(), and clang::ASTContext::Idents. Definition at line 921 of file DeclObjC.h. Referenced by createObjCPropertyGetter(), clang::Sema::DiagnoseOwningPropertyGetterSynthesis(), clang::CodeGen::CodeGenFunction::GenerateObjCGetter(), clang::CodeGen::CodeGenFunction::generateObjCGetterBody(), hasMRCWeakIvars(), hasObjCExceptionAttribute(), mustSynthesizeSetterGetterMethod(), clang::ASTDeclWriter::VisitObjCPropertyDecl(), and clang::TextNodeDumper::VisitObjCPropertyDecl(). Definition at line 905 of file DeclObjC.h. Referenced by clang::Sema::AtomicPropertySetterGetterRules(), clang::Sema::DiagnoseOwningPropertyGetterSynthesis(), clang::Sema::DiagnosePropertyMismatch(), clang::CodeGen::CodeGenModule::GetAddrOfGlobalTemporary(), clang::getPatternCompletionComment(), LookupMethodInReceiverType(), mustSynthesizeSetterGetterMethod(), clang::Sema::ProcessPropertyDecl(), SuperClassImplementsProperty(), and clang::ASTDeclWriter::VisitObjCPropertyDecl(). Definition at line 906 of file DeclObjC.h. Definition at line 823 of file DeclObjC.h. Referenced by clang::Sema::AtomicPropertySetterGetterRules(), and clang::ASTDeclWriter::VisitObjCPropertyDecl(). Definition at line 839 of file DeclObjC.h. Referenced by clang::Sema::AtomicPropertySetterGetterRules(), clang::Sema::checkUnsafeExprAssigns(), createObjCPropertyGetter(), clang::Sema::DiagnosePropertyMismatch(), clang::CodeGen::CodeGenFunction::GenerateObjCAtomicGetterCopyHelperFunction(), clang::CodeGen::CodeGenFunction::GenerateObjCAtomicSetterCopyHelperFunction(), LookupMethodInReceiverType(), mustSynthesizeSetterGetterMethod(), clang::Sema::ProcessPropertyDecl(), setImpliedPropertyAttributeForReadOnlyProperty(), SuperClassImplementsProperty(), clang::ASTDeclWriter::VisitObjCPropertyDecl(), and clang::TextNodeDumper::VisitObjCPropertyDecl(). Definition at line 851 of file DeclObjC.h. Referenced by clang::Sema::AtomicPropertySetterGetterRules(), checkAllAtProps(), checkAllProps(), clang::Sema::checkUnsafeExprAssigns(), hasWrittenStorageAttribute(), and clang::ASTDeclWriter::VisitObjCPropertyDecl(). Definition at line 932 of file DeclObjC.h. Referenced by clang::ASTDeclWriter::VisitObjCPropertyDecl(), and clang::TextNodeDumper::VisitObjCPropertyDecl(). Definition at line 944 of file DeclObjC.h. Referenced by findBackingIvar(), clang::Sema::GetIvarBackingPropertyAccessor(), and clang::ASTDeclWriter::VisitObjCPropertyDecl(). Definition at line 880 of file DeclObjC.h. Referenced by clang::Sema::AtomicPropertySetterGetterRules(), LookupMethodInReceiverType(), and clang::ASTNodeImporter::VisitObjCPropertyImplDecl(). Definition at line 885 of file DeclObjC.h. getSetterKind - Return the method used for doing assignment in the property setter. This is only valid if the property has been defined to have a setter. Definition at line 893 of file DeclObjC.h. Referenced by getMaxAtomicAccessSize(), and isSynthesizedRetainableProperty(). Definition at line 924 of file DeclObjC.h. Referenced by clang::CodeGen::CodeGenFunction::GenerateObjCSetter(), clang::CodeGen::CodeGenFunction::generateObjCSetterBody(), hasMRCWeakIvars(), hasObjCExceptionAttribute(), mustSynthesizeSetterGetterMethod(), clang::ASTDeclWriter::VisitObjCPropertyDecl(), and clang::TextNodeDumper::VisitObjCPropertyDecl(). Definition at line 913 of file DeclObjC.h. Referenced by clang::Sema::AtomicPropertySetterGetterRules(), clang::Sema::DiagnosePropertyMismatch(), clang::CodeGen::CodeGenModule::GetAddrOfGlobalTemporary(), clang::ObjCContainerDecl::HasUserDeclaredSetterMethod(), LookupMethodInReceiverType(), mustSynthesizeSetterGetterMethod(), clang::Sema::ProcessPropertyDecl(), SuperClassImplementsProperty(), and clang::ASTDeclWriter::VisitObjCPropertyDecl(). Definition at line 914 of file DeclObjC.h. Definition at line 948 of file DeclObjC.h. Definition at line 828 of file DeclObjC.h. Referenced by clang::Sema::CheckObjCPropertyAttributes(), clang::Sema::checkUnsafeExprAssigns(), createObjCPropertyGetter(), clang::Sema::DiagnosePropertyMismatch(), clang::CodeGen::CodeGenFunction::GenerateObjCAtomicGetterCopyHelperFunction(), clang::CodeGen::CodeGenFunction::generateObjCGetterBody(), IsValidIdentifier(), LookupMethodInReceiverType(), clang::ASTDeclWriter::VisitObjCPropertyDecl(), and clang::TextNodeDumper::VisitObjCPropertyDecl(). Definition at line 826 of file DeclObjC.h. Referenced by clang::Sema::AtomicPropertySetterGetterRules(), checkAllAtProps(), and clang::ASTDeclWriter::VisitObjCPropertyDecl(). Retrieve the type when this property is used with a specific base object type. 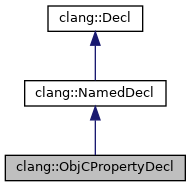 Definition at line 2237 of file DeclObjC.cpp. References clang::Decl::getDeclContext(), clang::Property, and clang::QualType::substObjCMemberType(). isAtomic - Return true if the property is atomic. Definition at line 867 of file DeclObjC.h. Definition at line 878 of file DeclObjC.h. Referenced by clang::Sema::AtomicPropertySetterGetterRules(), and clang::Sema::DiagnoseOwningPropertyGetterSynthesis(). Definition at line 877 of file DeclObjC.h. Definition at line 936 of file DeclObjC.h. isReadOnly - Return true iff the property has a setter. Definition at line 862 of file DeclObjC.h. Referenced by clang::Sema::DiagnosePropertyMismatch(), findBackingIvar(), clang::CodeGen::CodeGenModule::GetAddrOfGlobalTemporary(), hasObjCExceptionAttribute(), hasWrittenStorageAttribute(), mustSynthesizeSetterGetterMethod(), and clang::Sema::ProcessPropertyDecl(). isRetaining - Return true if the property retains its value. Definition at line 872 of file DeclObjC.h. Definition at line 847 of file DeclObjC.h. Definition at line 821 of file DeclObjC.h. Definition at line 922 of file DeclObjC.h. Definition at line 908 of file DeclObjC.h. Definition at line 824 of file DeclObjC.h. Definition at line 843 of file DeclObjC.h. Referenced by clang::Sema::CheckObjCPropertyAttributes(), and clang::ASTDeclReader::VisitObjCPropertyDecl(). Definition at line 855 of file DeclObjC.h. Definition at line 928 of file DeclObjC.h. Definition at line 940 of file DeclObjC.h. Definition at line 925 of file DeclObjC.h. Definition at line 916 of file DeclObjC.h. Definition at line 830 of file DeclObjC.h.